“Did he say blessed are the cheesemakers?”…Yes he did and right now I am beginning to see what Monty Python were on about. The first veiled blessing was leaving the cobbles of Weatherfield where Sean Wilson who played nations favourite Martin Platt for 21 years had plied his trade. But beneath that nurses uniform lurked something far more exciting..steady Madam..He had a passion to make artisan cheese and this year will see him fulfilling one of his pipedreams that seemed a million miles away sat in the studio’s in Manchester peering through the window, wondering just when he would have the opportunity and time to fulfil a few life ticks. Playing Gail's hapless husband was Martins challenge and is what we will remember him for right now but Sean himself is no stranger to a challenge. Since those heady day he h as been busy taking on all manner of challenges and nowadays you are more likely find him either up the Himalaya’s as patron of the charity D.C.W.C (www.dcwcnepal.org) conducting treks to Everest Base Camp and opening a number of schools in the remote areas of Nepal which Sean treats as another blessing, “Providing Nepali children with a chance in life has to be classed as one of the most rewarding and fulfilling things a westerner can do in life” admits Sean. 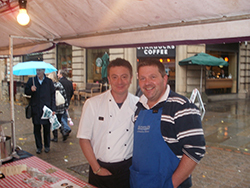 Conversely though Sean just loves talking about and making artisan cheese in his native Saddleworth and will very soon be opening “The Saddleworth Cheese Company!”. 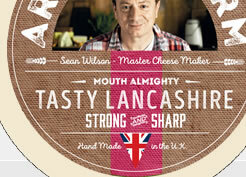 That’s all well and good but how did he morph himself into an artisan cheesemaker? 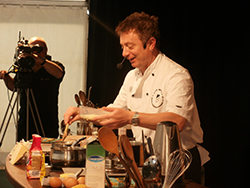 “Well I have been blessed in my life as a very good and keen home chef” says Sean who has all kinds of culinary leanings but concedes that his “desert island” style of cooking is French, indeed since leaving the Street he has cooked in several Michelin starred restaurants. He is a big Francophile and visits as often as he can. Scouring French food markets is an unashamed passion of his, as is French wine which eventually and inevitably leads you to cheese and mighty fine artisan cheese at that. “So now the dust has settled after leaving the show I have been putting every effort into learning cheesemaking and that’s where I have been truly blessed, as my mentor is the legendary Lancashire cheesemaker Bob Kitching at Leagram dairies”. 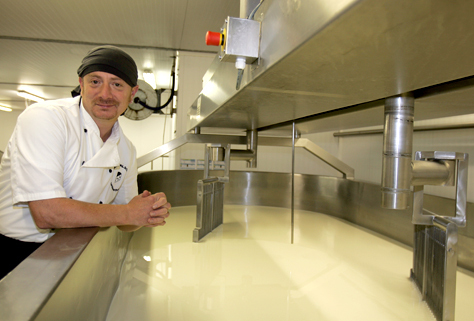 “I have a lot thank Bob and his family for as Bob has patiently been teaching me the cheesemaking ropes and I am now producing some bloody good Lancashires!”. “Bob has the knowledge alright” says Sean “With 40 years of hands on experience. Bob still says he is a happy cheesemaker and there is a lot to read into that, he keeps his cheesemaking diverse and also enjoys meeting his many customers on the market circuit all around the North West, plus he makes the best Lancashire cheeses I have tasted!” In fact Bob was voted one of the top ten cheesemakers in the country in the Sunday Telegraph recently and as Leagrams is by comparison to some, a small venture he can still put his cheese well and truly on the top table. So yes I think it’s fair to say Sean has truly been blessed and has started on his pilgrimage to provide hand made cheeses in his native Saddleworth for the delectation of the nation.